to all prisoners of war. Scouts and leaders left Auburn early Saturday morning to for a weekend of Civil War history and a better appreciation of the plight soldiers face as prisoners of war — appropriate topics for a week that included the celebration of Veterans Day. The troop's visit to the Andersonville National Historic Site in Andersonville, Ga., included the National Prisoner of War Museum; the site of Camp Sumter, the most famous of Civil War-era Confederate prisons; and the Andersonville National Cemetery. Guiding the contingent's journey through Civil War history was the park's historical trail questionnaire, which challenged Scouts to glean facts from displays and kiosks throughout the site. The troop developed a similar questionnaire for the Horseshoe Bend National Military Park as a service project during its March 2014 visit to the historic site outside Alexander City, Alabama. The troop began its walking tour at the National Prisoner of War Museum, which since opening in 1998, has told the story of prisoners of war throughout American history. Visitors are met with an exhibit answering the question “What is a POW?” Hands-on and multimedia displays following that introduction explore themes of capture, living conditions, news and communications, morale and relationships, and escape and freedom. of many of our "prisoners" in our online photo album. 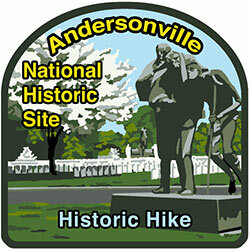 The next stop on the historic hike was the site of Camp Sumter, also known as Andersonville Prison. The historic prison site, which is celebrating its 150th anniversary in 2014, is 26.5 acres outlined with double rows of white posts to indicate the location of the original prison walls. Two sections of the stockade wall have been reconstructed — the north gate and the northeast corner. In walking the grounds, Scouts and leaders learned more about the living conditions faced by those imprisoned there, as well as their efforts to escape. After a picnic lunch, the troop provided service to the park by partnering with another visiting Boy Scout troop to fold the more than 150 American flags recently displayed during the park's Veterans Day commemoration. This gave newer Scouts the opportunity to learn proper flag-folding techniques and older Scouts the chance to refine their skills. In all, Troop 50 folded nearly 90 flags in just about an hour. The troop also helped strike and store two tents used during the recent holiday activities. From there, the troop picked up its historic fact-finding hike in the Andersonville National Cemetery. Initial interments, beginning in February 1864, were trench burials of the prisoners who died in the nearby military prison. Today the cemetery contains nearly 20,000 interments — including the nearly 13,000 soldiers who died during their imprisonment at Camp Sumter. The cemetery is one of 14 administered by the National Park Service and remains open and active for burials. After completing its tour of the cemetery, the troop arrived at its camping location, quickly got settled, and returned to the park for its quarterly night museum — an opportunity to experience the prison site grounds after dark. Scouts and leaders learned more about the role and perspective of prison guards as part of a character reenactment, as well as heard from a guest lecturer visiting from Texas A&M University who shared her research on Confederacy prison management, Union soldiers' efforts to escape, and prisoner exchanges between the North and the South. At part of its post-campout critique, the troop's Patrol Leaders Council the following Monday credited the historical elements, menu planning, the campsite location, and the inaccurate forecast from earlier in the week predicting a 60-percent chance of rain Sunday morning as positive elements of the campout. The PLC cited needs to improve basic knot-tying skills, food-preparation efficiency, and campsite/field trip etiquette.